It’s already March?! It seems like yesterday was January 1st. Time flew and now we’re a quarter of the way through 2018. Craziness. If your work week is anything like mine, the days blend together with meetings, tasks, emails, assignments, due dates, projects, and more. So much to do, so little time! 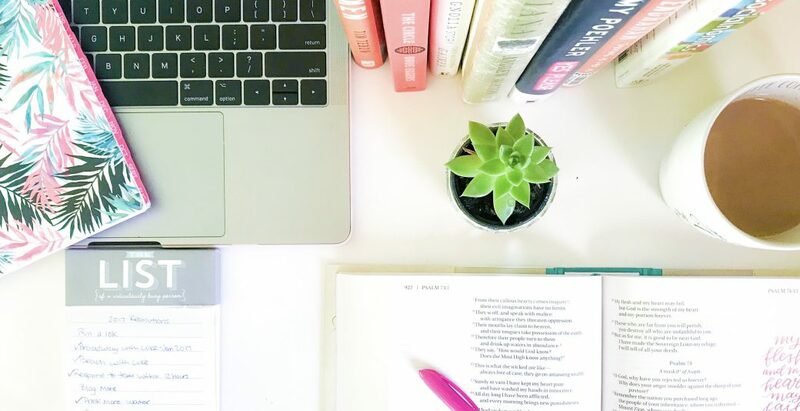 It’s easier said than done to stay organized, but I kickstarted these habits during my college years and never looked back. If you’re looking for ways to start your day organized and mentally prepared to tackle your to-do list, you’ve come to the right place. The process from waking up to arriving at the office is a couple of hours of pure craziness for me. The last thing I want to do is try to remember everything I have to do that day. Instead, I start the day before. Before I leave the office, I clean up my desk and write down all the tasks and meetings I have for the following day. I even write reminders to drink water, walk, eat lunch, and skim news articles. It may seem like a silly exercise, but cleaning my workspace and jotting my thoughts on paper before I head home relieve stress and serve as visual reminders of the next day’s priorities. It’s a simple trick that many fail to do, but when I make my bed, my morning is instantly better. It takes only a few minutes and once it’s done, I feel accomplished because I’ve already checked an item off my list. Plus, my room looks and feels cleaner because the pillows are off the floor and the blankets are folded neatly. “Hangry” is definitely a thing. Not only does eating breakfast give me the necessary fuel my body craves in the morning, it also brightens my mood and releases those hangry tendencies. I typically eat eggs and sausage for breakfast, which give me a quick boost to make sure I’m mentally and physically ready to tackle the day ahead. I am a huge coffee lover. I drink at least 24 ounces every day, but I try to drink even more water. Before I drink my first cup of coffee, I sip water first. It not only helps me start the day healthy and hydrated, but it also gets me in the right mindset to tackle the day head-on. Plus there are tons of health benefits on why drinking water first thing in the morning is good for you so it’s a win-win! Once I arrive at the office, I sip my coffee, check my to-do list, and dive into emails. I don’t typically check my emails first thing in the morning. I wait until I am at my desk before I open my inbox so I can give myself enough time to sort through, read, and respond to them all at once. While I check my email, I write any additional to-dos to the list. It kills two birds with one stone because I’m keeping my list updated while also trimming down the number of emails in my inbox. I’m a color-code, check-everything-off kinda girl. You may be like me, or you may not be. Whatever works for you, stick to it. For me, I check things off as I go so I can visually see my progress. I have a notebook dedicated to my daily lists, a planner for important dates and reminders, a monthly wall calendar, and a pad used only for weekend goals & tasks. I’m a bit Type-A, can you tell? You don’t have to manage the same system I do but find what works for you and stick to it. One major way to stay organized and ensure you’re ready to take on the day is to find a system that works for you and do it until it becomes a habit. Similar to the organization system, stop avoiding the unavoidable and just do it. Know when you’re most alert and productive and do the harder tasks then. For me, I write better in the morning so I try to do a lot of my writing when I first arrive at the office. I also am more creative in the afternoon so I try to plan in a way that allows me to tackle creative projects then. However you operate, try to accommodate your to-do list around it to ensure you are creating your best work every day.